The international crimes tribunal has fixed August 30 to give an order in a contempt of court against freedom fighter and Gonoshasthaya Kendra founder Zafrullah Chowdhury for his contemptuous remarks on its judges. The three-member International Crimes Tribunal 2 led by Justice Obaidul Hassan set the date after hearing the arguments from both the petitioner and defence counsels. Zafrullah Chowdhury’s lawyer Baset Mazumder told this to the Dhaka Tribune. Gonoshasthaya Kendra founder Zafrullah Chowdhury Sunday offered unconditional apology before the tribunal for his contemptuous remarks on its judges. Sayed Ahmed Raza, a counsel for Zafrullah, submitted the petition before the three-member tribunal led by Justice Obaidul Hassan. The tribunal set Monday to hear the matter. 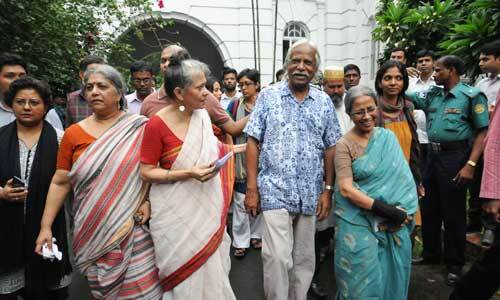 Freedom fighter Zafrullah was present at the tribunal during the submission. A video footage containing his comments was shown inside the court. On June 10, Zafrullah served one-hour imprisonment in the courtroom and was fined Tk5,000 for criticising a verdict that penalised Bangladesh-based UK journalist David Bergman in December on contempt charges. Upon this remarks, a petition seeking contempt proceedings was filed against the Magsaysay award-winner by three freedom fighters and two organisers of Gonojagoron Moncho. In response, the tribunal sought explanation from Zafrullah. He also filed a petition with the Supreme Court refusing to pay the fine imposed by the tribunal. After hearing, the apex court quashed the tribunal’s judgement as he tendered unconditional apology. The court also asked him to be cautious while making remarks about the judges and judicial system of the country. Earlier, the tribunal 1 had found his comments on the trail procedure contemptuous, but later pardoned him with a serious caution. The freedom fighter gained prominence after playing a key role in formulating the Bangladesh National Drug Policy in 1982. In 1971, he was one of the organisers of the 480-bed Bangladesh Hospital for freedom fighters and the refugees during the 1971 Liberation War.